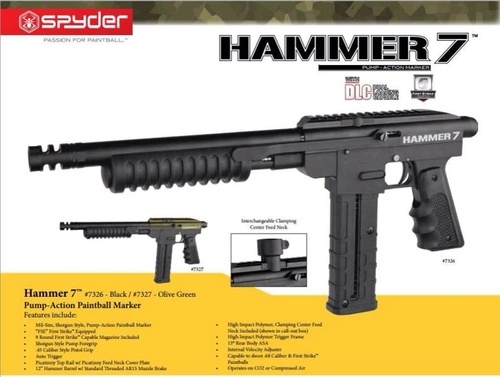 The Spyder Hammer 7 is a brand new marker from the makers of Kingman Paintball Products. This magazine fed marker is fully equipped to work with First Strike rounds and includes a First Strike capable magazine. The Spyder Hammer 7 is primarily a magazine fed pump gun but also includes a feed neck so you can mount your favorite loader and increase your overall ammo capacity.